Office Staff set the tone for your agency. Getting this right will set your agency on the path for growth. 1. We provide you with the job ad to help you get the word out in your community. Anne-Lise will and help you identify the candidates who best match your needs. 2. As the business owner, you conduct the initial screening of resumes you receive using our resume screening tool. 3. You interview with each candidate using our interview guide and select the top three. 4. 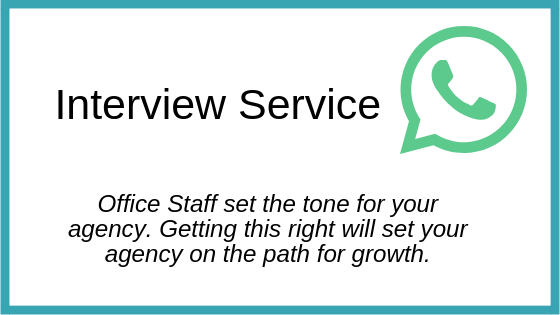 Anne-Lise will interview each candidate on the phone, send you a summary of the interviews and work with you to make an offer to the best candidate.